Tinker T struggling to escape the clutches of the sticky mud in her berth in Dolphin Pool half an hour before low water feared they might not be the only victims of low tide, and thus it was so. A depleted fleet made the start line at Gilkicker with the J109's likely preparing for the SOR and at least one other, Kurketrekker trapped by the mud in their marina berth. A shame as the best breeze of the series so far materialised. 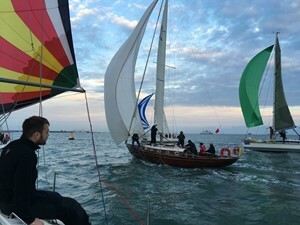 The SOOD Option had irresolvable problems with her headfoil and Tinker T took over as the SOOD, setting a course of a beat to Kemps Quay, reach to Mother Bank and a run home. With only seven boats the starts were combined. Tinker T and Sunshine were first to Darling Associates and Tinker T opted for the right hand side of the beat whilst Sunshine tacked left, left eventually paid with more breeze. Sunshine led the fleet home but with Danegeld revelling in the conditions she took the handicap win in both IRC and NHC.